Set outside The Oast House in Manchester's Spinningfields business district, Disaronno have been putting on some of the best emerging talent in UK music over the past few weeks. We caught Teleman performing in this slightly surreal environment and impressing us with tracks from their recent debut album Breakfast. 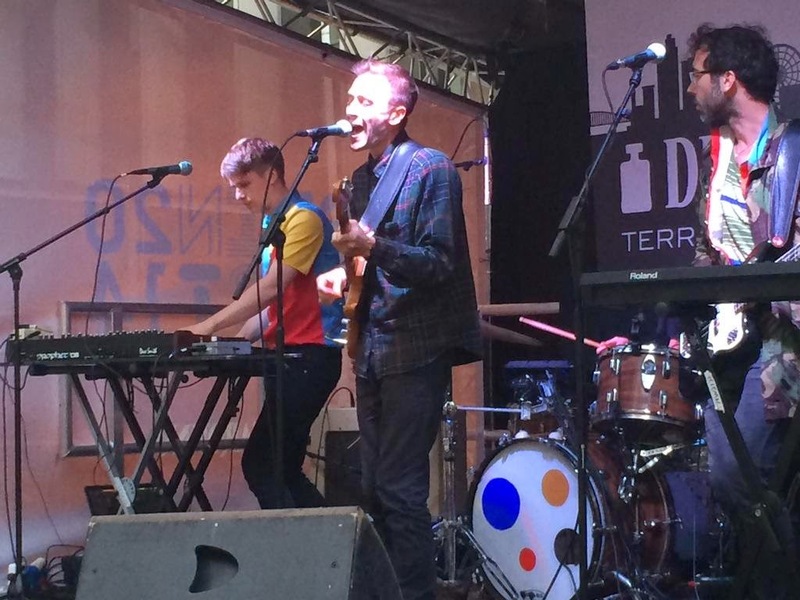 Teleman are a perfect band for listening to on a warm summer's evening with a cold beer in hand. There's a sparsity to their sound, a stubborn refusal to put layer upon layer into their songs that makes them an absolute joy to listen to. Those elements that make Breakfast such a refreshing change from other indie bands trying too hard are also captured in their live show. Elements of Orange Juice and tints of Pavement are brought up to date with Jonny Sanders' synths and they're incredibly tight live. Front man Tom Sanders' half-sung, half-spoken vocal fits the mood of the songs, a more gung-ho approach wouldn't work and the rhythm section of Pete Cattermoul on bass and Hiro Anamiya on drums provide that firm foundation to which Jonny attaches his synths to create a sound that's uniquely theirs. There's little interaction with the crowd, although some of that's probably down to the fact that a large part of that are sadly here to be seen and not for the band, and very little visually with each other, but it just adds that little bit of mystique to them. We're treated to eight songs from Breakfast plus set closer b-side Not In Control. The singles, well chosen for release, are the songs that grab the most attention of the crowd and raise them from their sickly almond cocktails, particularly the shimmering beauty of debut Cristina and the funk-infused tinges in Skeleton Dance, but the quality doesn't drop throughout. Teleman's official website can be found here. Their new single Skeleton Dance is out on Monday (18th August). They are also on Facebook and Twitter.